Sweet William is the latest addition to Ineke's Floral Curiosities collaboration with Anthropologie, and like the other fragrances in the collection (Angel's Trumpet, Scarlet Larkspur and Poet's Jasmine), it is inspired by old-fashioned garden botanicals. 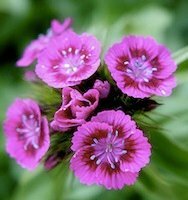 "Sweet William" is the informal name for Dianthus barbatus, which Ineke describes as a "clove-scented" flower with a spicy, woodsy scent. The fragrance includes notes of peach, cinnamon, clove, cumin, cedarwood, sandalwood, patchouli and Bourbon vanilla. I'm a longtime fan of clove-y fragrances and carnations (another dianthus species! ), so I gravitated towards this Floral Curiosity more than any other in the group. 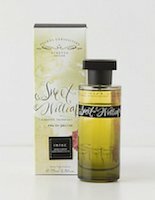 As it turns out, Sweet William is one of my favorite Ineke perfumes so far, but I wouldn't call it a clove fragrance, and it's certainly not a carnation-like scent. Its actual smell on my skin is nothing like what the list of notes had led me to expect: I don't detect any cinnamon or cumin or patchouli, for example. What I do smell at first is a greenish, sweetly balsam-piney scent that reminds me of the bayberry and juniper candles for sale in Colonial America-themed gift shops. It's a smell that I happen to enjoy; I just didn't anticipate it as part of Sweet William. Sweet William gives off noticeable sillage during its first hour or two, and it has excellent lasting power: I applied one spritz to each wrist when I left the house in the morning, and at the end of the workday, I could still smell it on my skin. (That's very unusual for me.) It remained consistent throughout the morning. By mid-afternoon, however, it had turned less aromatic and green, and more powdery-woodsy, with a warm peach note emerging at last. The woods in Sweet William's base are soft and musky, turning into a faint skin-scent by early evening. I've never really found a fragrance to love in the original Ineke collection — I think the fragrances are consistently pleasant, and I recommend them often, but they're just not my style, somehow. And the rest of the Floral Curiosities didn't make much of an impression on me when I "visited" them in Anthropologie, but I've gone back repeatedly to my Sweet William sample vial. It's a slightly unusual fragrance that suits my winter mood, perhaps because of its holiday greenery associations. The packaging is nicely done, too (as usual for Ineke and for Anthropologie's collaborations) — that travel size would make a nice gift. Ineke + Anthropologie Sweet William is available in 75 ml Eau de Parfum ($68) and 15 ml travel spray ($28), via Anthropologie. Note: image is Pink Swirls by aussiegall via Flickr; some rights reserved. This is my favorite of the Ineke Floral Curiosities, by far. I haven’t tried her main line fragrances really. Need to remedy that. But I must say, Ineke has always been very savvy about making samples available. One of the many nice things about this line. I def concur with Jessica’s assessment–the clove eluded me altogether–and would just add, I did feel Sweet William lived up to its name: to me it was very sweet indeed. Whether one considers that a plus or a minus will vary, I imagine! C.H., I usually do like sweet scents, so I didn’t find this one too sweet at all. That’s my taste, however! I agree about the packaging. The bottles and boxes for the original line are wonderful, and so are these. Anthropologie does encourage pretty packaging in its collaborations! I have the travel spray of Sweet William. It’s the only one of the Floral Curiosities line that I liked. I don’t get clove in it much either, but I get the cumin and the peach notes comes out earlier for me. Luckily with the peach and vanilla, the cumin isn’t sweaty to me. I also get kind of a buttery note in the drydown, similar to but stronger than a note I get in SL Santal Majuscule. I finally got the try the main line too.. go the A-G sample set in the Perfume Posse swap that happened a couple weeks ago. So far I don’t care for most of them — too fresh, too fruity, too powdery, etc. I’m wearing Field Notes from Paris today.. I’d expected to really like this one, but I haven’t made up my mind about it.. I think the coriander is bothering me a bit. I really like Evening Edged in Gold, though.. that one may end up being my favorite. Sweetgrass, I remember liking Evening Edged in Gold, too. And the name is lovely. I was also relieved not to encounter any cumin-related “sweat” in this fragrance! I keep trying Field Notes because it is so much the type of thing I should like, but it never grabs me. Evening Edged in Gold, on the other hand, I absolutely love. Yay for Evening Edged in Gold – its like happiness in a bottle! I will also say that Ineke’s lines have really great packaging. I really like the hollowed-out book boxes of the Floral Curiosities travel sprays, and the packaging in the sample set is really pretty too. And the fact that she/they even offer/s a sample set is commendable!! I get cinnamon, cumin, patchouli, pine AND juniper. And a lot of sweet up top. It reminds me of some old-school earthy masculine, would probably be good on a man. I think it’s a nice brave scent. I agree, a man could wear this! I admire it for being unusual, too. I really do like Ineke’s style, none like it out there. I do like AEEIG and FN. I haven’t tried much from the FC line but I did try SW and I wasn’t very impressed. While nice, I didn’t smell any carnation. There are much better carnation scents out there. I didn’t even get much spice from what I can remember. D&G Velvet Love, while really spicy, has a really strong, nice carnation note. There is also the Caron if you can do musky. I expected a carnation fragrance, but this definitely isn’t one! I like rosey, powdery carnations like Bellodgia and Etro Dianthus. I’m so happy to see a review of this one. I wasn’t expecting to like it as much as I did when I tried it on at Anthro about a month ago. It is definitely my favorite Ineke. None have really worked very well on me before this one, but my boyfriend was happy to get my hand-me-down Field Notes decants. I don’t often enjoy peach in perfume, but I think it was really spot on here, especially mixed with some cumin and darker notes. I see a travel size in my future!